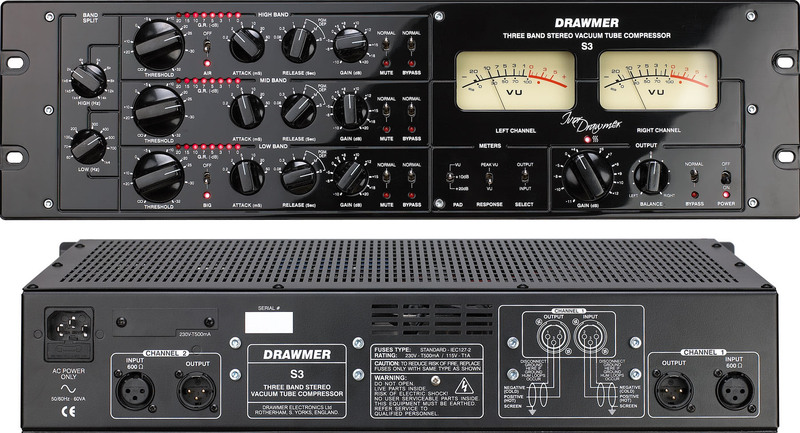 New Analogue Power for our Hybrid Mastering Suite – Drawmer S3 Mutliband Compressor arrived! The ‘Signature Series’ S3 Stereo Three Band Tube Compressor incorporates the very latest in Ivor Drawmer designs and the aim from the very beginning was to create a ‘no technical compromise’ circuit using only the highest grade components. The S3 forms the basis of a ‘Signature Series’ and offers previously unattainable control and tonality over each of the three bands – gain control at each stage provides precise spectral balancing. The signal path consists of high performance input/output transformers, passive components and 10 x tubes (8 x ECC83 and 2 x 12BH7) configured as a fully balanced Class A design. Because the LDRs (Light Dependent Resistors) in the compressors are temperature sensitive the S3 houses an ‘electronic oven’ which provides and sustains the optimum LDR operating temperature – thereby maintaining calibration accuracy and improving performance. A front panel LED indicates temperature status. Large scale VU meters can be switched to ‘Peak’ mode to show transient information. Two further VU meter re-scale modes are available (+10dB and +20dB) to accurately display the unit’s ability to output levels of up to +30dBm. The master output section includes controls for both Gain and stereo balance to compensate for source material with a Left/Right imbalance or disproportionate processing. FULLY BALANCED SIGNAL PATH CLASS A DESIGN. ISOLATION TRANSFORMERS IN AND OUT. 20 x ACTIVE TUBE STAGES. HIGH POWER ‘PUSH/PULL’ OUTPUT STAGE DELIVERING UP TO +30dBm. FAST REACTING ‘OVEN’ CONTROLLED LDRS TO MAINTAIN CALIBRATION. ACCURACY SWITCHABLE ‘PEAK’ OR ‘VU’ METERING TO DISPLAY TRANSIENTS. SWITCHABLE +10dB OR +20dB METER RE-SCALE MODES. ‘AIR’ MODE FOR HIGH BAND. ‘BIG’ MODE FOR LOW BAND. SWITCHABLE MUTE AND BYPASS ON EACH BAND. INDIVIDUAL GAIN REDUCTION METERING ON ALL BANDS.